Does the storage big-shot have a big storage shot in the arm in store ... age? Imation has recruited BlueArc and Drobo founder Dr. Geoff Barrall to its board. Barrall has an impressive storage, having founded BlueArc, a hardware-accelerated filer startup which was bought by HDS. Subsequently he was the founder and CEO of Data Robotics, the startup which produced the Drobo (Data Storage Robot), a CTO and engineering VP at Overland Storage, and a board member at Nexsan until that company and its SAN business was bought by Imation in January last year for $120 million. He then started up Connected Data which makes the Transporter peer-to-peer, private cloud file sharing device. Connected Data acquired Drobo in May 2013. On top of that, Barrall is chairman of Gridstore, a scale-out storage startup. We particularly like this phrase: "previous success with results-driven businesses," trying and failing to understand what success with a non-results-driven business would mean; bankruptcy perhaps. 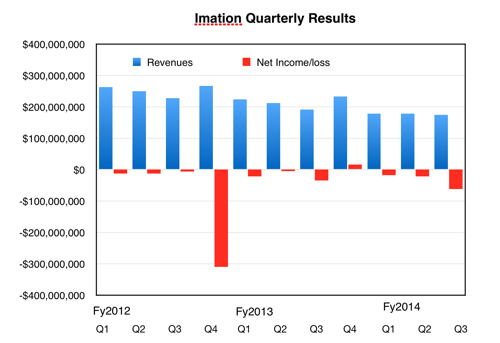 The issue we see with Imation and its Nexsan subsidiary is that Nexsan revenues are not growing fast enough to pull Imation out of the black hole its previous over-reliance on magnetic tape and optical disk media had excavated. Nexsan is pretty much a traditional SAN supplier and that business is facing multiple challenges from server-side SANs, all-flash arrays, efficient hybrid array startups like Nimble Storage, scale-out storage like Gridstore and Exablox, and, of course, the public cloud. Nexsan has its own hybrid flash/disk array tech but that hasn't set the world on fire yet. The third L White Matthews quote above talks of "high security data storage and solutions"; two big suppliers, EMC and Symantec, have failed to find significant synergies by combing storage and security for enterprises and it seems doubtful that Imation can make a go of it where these two have failed.